You are the driver of the blue car. Of the four hazards marked, which one is most likely to require you to take urgent action? You are the driver of the blue car. Of the four hazards marked, which one is most likely to require you to take urgent action? This is a scenario you could encounter almost every day if you drive in urban areas. Let's take a look at the hazards. In general, this is an intersection with good visibility. 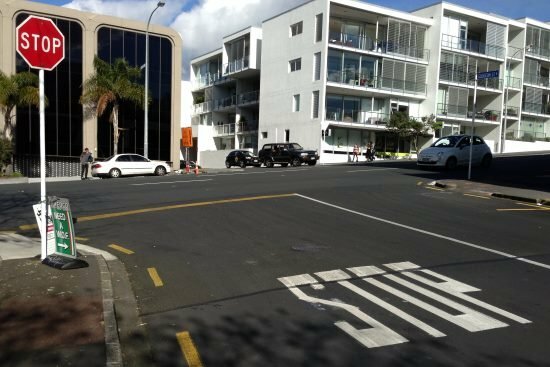 There's nothing on the pavement to hide pedestrians, and the road is clear with no islands or crossings. There's no signage shown that could be distracting. Contrast it with the junction in this photo where there are vehicles waiting over the road in an intersection with poor visibility, a pedestrian waiting on the left, a deep shadow making it more difficult to see the Fiat on the right, and a roadworks sign. What you can't see in this photo is that there's a bus stop just around to the left, and a busy supermarket with many pedestrians crossing the road and waiting in the centre. Vehicle A is turning left onto the opposite side of the road and you are almost at the turning, therefore A does not cause a hazard. Vehicle B is partially obscured by vehicle D, but is unlikely to manoeuvre to cause you any problems. The only problem vehicle B could cause is to hit D from behind. As D's wheels are already turned towards the driveway, this will shunt D into your path. This is a reason why when you are waiting to turn across a lane you should keep your wheels facing forward. It's better to be shunted into the back of a car in front than across into the path of traffic coming the other way. Vehicle C would only be a hazard if it had to stop suddenly and there's no indication that that would happen in this diagram. However, the driver of D on the other side of the road, turning right into the driveway, may misjudge the distance between you and car C. You should be prepared to slow down or stop. Also, an advanced driver would notice that this is an older car - a Volkswagen Beetle. It's likely to have slower acceleration. It will almost certainly be a manual gearbox and therefore the driver could stall it half way through the turn. The other thing advanced drivers will look out for is the age of the driver of the other vehicle. Very young drivers are likely to be impetuous and lack skill in judging distances, whereas older drivers could have less visual acuity and perhaps slower reactions.